1. Which command turns on a router interface? Refer to the exhibit. Which password or passwords will be encrypted as a result of the configuration that is shown? 3. 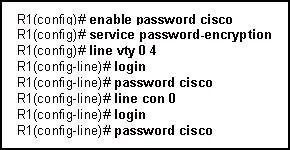 Which mode will a configured router display at login? 5. How does the SYST LED on the catalyst 2960 switch indicate a POST failure? 7. A technician has made changes to the configuration of a router. What command will allow the technician to view the current configuration before he saves the changes? 9. To save time, IOS commands may be partially entered and then completed by typing which key or key combination? 10. What is the correct command sequence to configure a router host name to 'LAB_A'? Refer to the exhibit. From the router console, an administrator is unable to ping a Catalyst switch that is located in another building. What can the administrator do from her location to check the IP configuration of the attached switch? • Open an SDM session with the switch from her desktop. • Telnet to the switch from the router console. • Use the show cdp neighbors detail command from the router console. 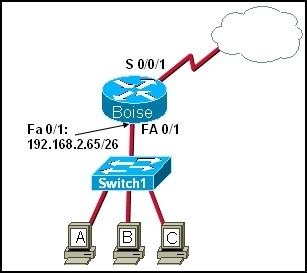 • The administrator must go to the switch location and make a console connection to check these settings. • View a list of commands entered in a previous session. • Recall up to 15 command lines by default. • Set the command history buffer size. • Recall previously entered commands. • Save command lines in a log file for future reference. 15. What option within Cisco SDM Express must be configured to allow hosts that receive IP address settings from the router to resolve names on the network or Internet? 17. Which command will display routing table information about all known networks and subnetworks? 18. A network administrator needs to configure a router. 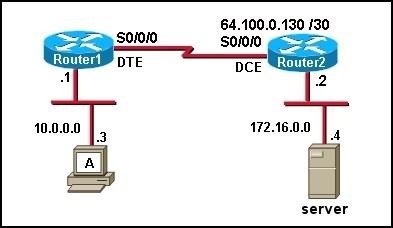 Which of the following connection methods requires network functionality to be accessible? Which function is a unique responsibility of the DCE devices shown in the exhibit? Refer to the exhibit. Which series of commands will enable users who are attached to Router1 to access the remote server? 23. A network technician is attempting to add an older workstation to a Cisco switched LAN. The technician has manually configured the workstation to full-duplex mode in order to enhance the network performance of the workstation. However, when the device is attached to the network, performance degrades and excess collision are detected. What is the cause of this problem? 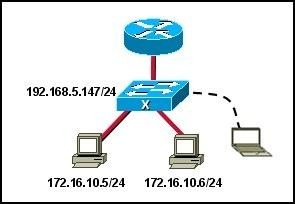 • The host is configured in a different subnet from the subnet of the switch. • There is a duplex mismatch between the workstation and switch port. 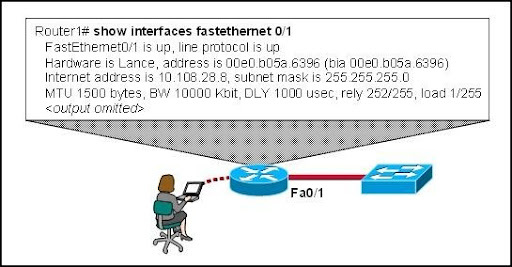 • The switch port is running at a different speed from the speed of the workstation NIC. • The host has been configured with a default gateway that is different from that of the switch. • All router commands are available. • Global configuration mode can be accessed by entering the enable command. • A password can be entered to allow access to other modes. • Interfaces and routing protocols can be configured. 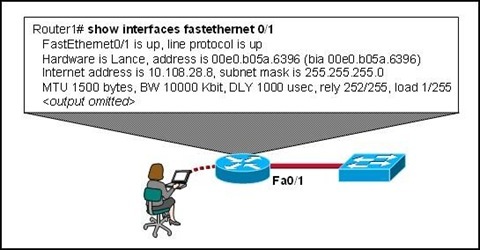 • Only some aspects of the router configuration can be viewed. • SDM is used for in-band management only. The IOS CLI can be used for in-band and out-of-band management. • SDM is accessed through a Telnet application. The IOS CLI is accessed through a web browser. • SDM is available for all router platforms. The IOS CLI is available for a limited number of Cisco devices. • SDM utilizes GUI buttons and text boxes. The IOS CLI requires the use of text-based commands. • SDM is used for advanced configuration tasks. The IOS CLI is preferred for initial basic device configuration.